Last year was a great year to be a loan originator. Next year probably not so much. This year, we’ll see. In 2012, residential mortgage lending increased by an impressive 38%, compared to volume seen a year earlier, according to Home Mortgage Disclosure Act (HMDA) data released today by the FFIEC. The agency said it compiled data on 15.3 million home loan applications during the year, of which 9.8 million resulted in loan originations (funded). That’s an additional 2.7 million closed loans compared to figures in 2011. The increase was driven by refinance loans, which experienced a 54% increase from a year earlier as mortgage rates flirted with record lows. Home purchases were no slouch either, chalking a 13% year-over-year gain from 2011 as buyers cautiously fell back in love with real estate again. Of course, not all types of lending experienced gains in 2012. The popularity of FHA loans continued to decline, with the gov loans snagging a 27% share of first-lien home purchase loans, down from 31% a year earlier. The market share of FHA loans will probably continue to fall thanks to higher mortgage insurance premiums and insurance that stays in force for the life of the loan. At the same time, the number of VA loans reported increased 11% from 2011, though their market share held steady at roughly eight percent. While government loans continue to play a significant role in the home purchase market, it is conventional loans that continue to dominate the refinance market. During the year, conventional loans accounted for 85% of all refinances, while FHA and VA loans held much smaller shares, at nine and six percent, respectively. 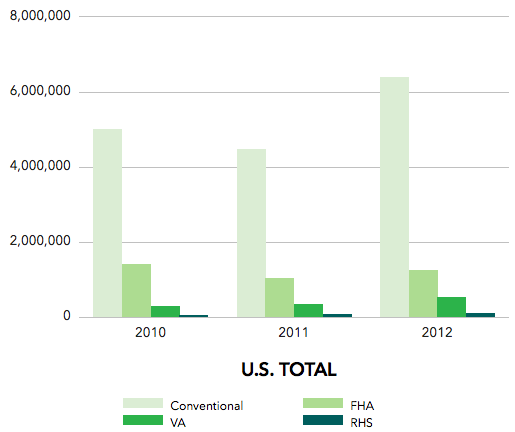 Still, conventional refis only increased about 51% from 2011 to 2012, while refis backed by the FHA or VA jumped 78% and 90%, respectively. My guess is that the bulk of the FHA’s share came via its streamline refinance program, which has very few requirements for approval, allowing even those who are underwater to refinance. Number of applications & originations by loan purpose. Number of originations by loan type. The CFPB also released their own HMDA data today, with their focus on first-lien, owner-occupied one-to-four unit family and manufactured homes. The newish agency noted that the surge in home loan refinance activity varied greatly by region. 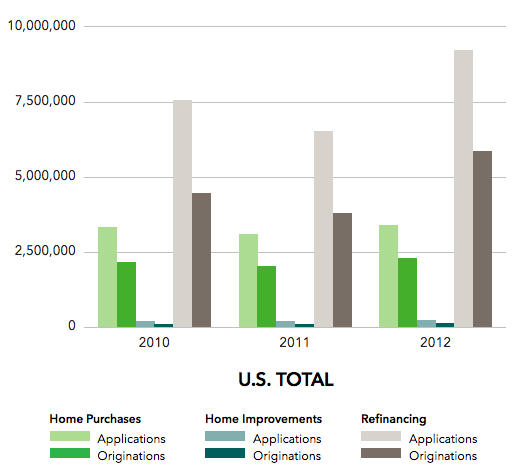 For example, in Cincinnati, Ohio, refinance originations were up 47%, while Las Vegas saw a ridiculous 205% increase. That variance is perhaps attributable to the number of HARP loans processed in Sin City as homeowners who were previously handcuffed by negative equity found a way out through the program. The agency also revealed that VA lending was huge in metropolitan areas like Gulfport, Mississippi, where 21% of loans were VA, and Fairbanks, Alaska, where 29% of loans had a VA guarantee. These regions of the country are dominated by military families that can take advantage of the generous lending policies offered by the VA. 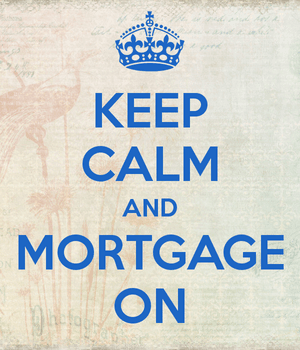 In all, there were roughly 18.7 million HMDA records collected from 7,400 financial institutions last year. Back in 2006, when the housing market was humming, data was gathered from over 8,900 banks, credit unions, and mortgage companies. Well I guess that means that we are on the right track!!! Thanks for the post.